Hi Staci, love and love your painting, yes, for sure there is always hope. I’ve read Elliot’s poetry, such a great mind. And no doubt TV shows are a cultural wasteland these days. I don’t watch TV and don’t let my kids watch either. The older one don’t care for TV, but the youngest like few shows (because some of his friends talk about them at school), so on Saturday I let him watch few shows. These ‘reality TV shows’ are such garbage, I don’t believe how these things can go on. Have a great weekend! Hahaha. Yes, the reality shows. The way society is now, we need to watch other people’s reality in relationships for entertainment. T.S. Elliot was truly an amazing man and poet. I still hope to, one day, do a deeper study on The Wasteland. However, I would like to read more of his poetry post-Wastland as well. This quote from The Four Quartets is absolutely beautiful (I think). Have a beautiful weekend as well Elizabeth. Love this Staci! Powerful words and stunning image. Yes, our culture is often a wasteland and yet, there is beauty that shines through. The darkness will never overcome the light. Hey Mark, thank you so much. I have become a fan of TS Eliot myself. He has some very strong and powerful words. Have a great weekend. Bless you. What I find most tragic about western civilization, is that they don’t consider themselves authentic, or valuable. The war on goodness, Christianity, morality, as mean, immoral, unjust, and illegitimate is horrifying. It’s reflected in prime time TV, movies, and pop culture. Myself, I watch 1 prime time TV show, occasionally. We just cut our cable selection down to the lowest level, and we maintain it only for sporting events. If I do watch, I will go to Turner Classic Movies and watch John Wayne movies, or Jimmy Stewart. I will have to go back and read some TS Elliot. It’s been a long time. We do have to hope for better things, and love the misguided. Hi Wendy. Great comment. Yes, the decline in western culture has truly been tragic. Look where we are today. I was reading on one site that TS Eliot wrote The Wasteland because he basically felt that Western culture was headed to hell in a handbasket, and that people were getting dumber and dumber (http://www.shmoop.com/the-waste-land/). Yea, I’m not much for TV. I have other things that I want to do like study drawing and art. Hahaha. I watch it when I’m tired actually. I don’t have to think or force myself for that. Hahaha. Just goes to show you how un-educating TV can be eh. Hahaha. Love the artwork and the post, Staci! Yes, definitely western culture is decaying, but there are shiny beacons of hope found in some people, who still value truth and what’s right, who hold onto good values. Love and hope are indestructible. Remember 1 Corinthians 13:13 – Faith, Love, Hope remain forever, and the greatest of these is Love. I am not very familiar with Eliot’s poetry, but I will sure look him up. Thanks Sibella. Oh yes, please do look him up. He won a Nobel prize even. Check out the link I added about him. It’s amazing. First, your art is perfect for your topic today. I think television and flim has, in large, become a cultural wasteland. In part, and I may get some grief for this, I believe it’s part of a secular movement that rejects morality in concept. I feel as though it’s an attack on families, and especially on children. Oh totally Rob. Read the link I added on TS Eliot and you will see his response to the book he read. basically, a lot of it is the result of the decline in moral conviction, faith and humanism I think. Thank you so much. I’m so glad you think the art goes well with this. I actually did this art piece for a Brazilian arts thing. I was asked to do an art piece and then they are going to get a Brazilian poet to interpret it. After they will be doing a virtual exhibition. Pretty cool eh. Couldn’t have put it better, myself. Sometimes I feel overwhelmed because many have decided that evil is good and good is evil, as foretold in the Bible. But then God reminds me about the verse (I can’t find it right now, so sorry for the huge paraphrase) that says that while the evil will become more evil, so will the good become more good. And it also seems like things aren’t getting any better, doesn’t it? Hmmmmm. Awwww, thank you so much Trini. T.S. Eliot is a well known poet (playwright, essayist, etc.) from the past. One of the major writers from the 20th century. He even won the Nobel Prize in Literature. Yea, I guess all cultures have their good and their bad. No one culture has it all together right. Haha. Hello beautiful soul!! You are rocking the art my friend…everytime I see a new creation I can FEEL the love and nurting aspect that leaves your body and embeds in the creation!! I understand your post…and I have concern over much that easy written in your comments. I find it harder and harder to be a part of the world from a ‘news’ perspective. It seems they only show what is bad or wrong with society…and at this point, dear heart, I am more concerned with what is beautiful and right with the world!! Thank you for adding your beauty…and nd I will have to read T.S. Elliot…based on your beautiful recommendation!! Hello Dear Lorrie. Thank you so much. I love your comment. ‘Rocking the art’. That’s great. You are such a sweetie. I am right there with you Lorrie. I don’t watch a lot of news. I think it causes fear and negativity in people. And you are totally right about the media only showing what is bad or wrong with society. It’s that type of news that sells. A lot of the time it’s sensationalism too. Thank you again for your beautiful comment and sweet words Lorrie. You are a gem. My life is full of sweet things, yes. I hope that yours is too. That picture is wonderful. And as regards your question, I think the west has lost its priorities more than anything and has misplaced it’s true culture because of it. Thank you so much Richard. Yes, I agree. Lost its priorities, as well as principles and values. I see such hope in your art, Staci. I love this! I haven’t read much T.S. Elliot but will now read his poem. As for American Television, I avoid it. There are so many reality shows that are not based in any reality I know. I feel better about myself and the path I’m on when I don’t read or watch stuff that seems to want to make me feel bad about my life. I actually don’t get too caught up in the news. I think that the media blows things out of proportion and sensationalizes a lot of stuff. My mother-in-law watches the news continuously and she gets all fearful and focuses on the negative. Not that I don’t think it’s good to know what’s happening around the world, but there’s a need for balance. Oh yes, reality shows really don’t show much reality, do they. Hahaha. Thank you for your kind words about my art Geralyn. I’m glad that hope is what came across. T.S. Elliot was an amazing poet. The Wasteland is all over the place. It doesn’t make a whole lot of sense. But at the same time, it’s genious, because he’s writing out of what he sees happening in the world and western culture. It bothered him greatly. I work with someone who listens to the news and gets alerts on her phone throughout the day and announces whatever horrible situation the media is covering. I try really hard to tune it out. You have a great week, too! Oh, do not ask, “What is it? Haha. That’s great. Thanks for the TS Elliot tidbit Jennifer. You too, have an awesome (high-pitched) week ahead. Hi – your art is interesting and the pop of blue is cool – I read the above comment that u made this for an event and it will be interpreted (also cool) but I cannot imagine what this looks like – is this only digital? Is it a panting with the ribbon added – it says mixed media and I am so curious. Hey there. The art is mixed media because I used a few mediums in it. It isn’t digital. I painted the background with oil paints. Then I did the tree and funky flower (ribbon) in acrylics. I also used black china ink, graphite pencil and a white gelli pen. I got news today that the virtual art exhibition will be released tomorrow. It will be interesting to see how the poet interpreted it. As for the cultural wasteland, I think most people were thinking that I was putting a focus on American TV here. That wasn’t my intention at all actually. I simply put the description that Google gave. I was thinking more on a sociological level in general. I’m not much a TV watcher, and I do think there’s a lot of crap on TV, but there are good things as well, like documentaries and other programs like you mentioned in your comment. As for books and music, I’m pretty particular about what I read and listen too. I’m not a ‘novel’ person, nor top 40 really. I do think there is a lot of trashy music, but I think, like any art form, it comes from and is created out of a worldview, which many times is shaped from what the culture is and trends in society. Thanks so much Yvette, and please have a wonderful rest of the week. Staci, this is a terrific post. Your artwork “Hope” is beautiful and the words that you paired with the image, perfect! Wonderful quote from the “Four Quartets”. You know that I’m a huge fan of T. S. Eliot, so of course I am delighted to see this post. If you liked “The Waste Land”, you may enjoy reading “The Hollow Men”. Please take good care. Hi Pepperanne. It’s so great to see you here, and thank you so much for your kind words and comment. Take care Pepperanne, and have a wonderful rest of the week. I love your mixed media art! It is the perfect companion to your poem. Or vice versa, depending on which came first – the poem or the art! Awwww, thank you so much. The art came first actually. I was asked to do a piece for a project here in Brazil. Once I finish doing it, they send it to a poet to interpret it. Then it’s exhibited in a virtual exhibition. Pretty cool eh. Well, it does appear this way (wasteland World and USA), but we cannot stem the tide. The time map has been drawn, however, just like we are to run the race (Paul), press toward the mark, do what we have been assigned to do wholeheartedly with no complaint, well, so it is that the equation persists though I have not seen the graph, a portion which still understands what is true value and a portion which has a different and irrelevant measure (irrelevant in Glory). We do what we should and can, those who have been outfitted. I despair of my reactions to the present picture, that’s why I look unto the Author and finisher of my faith. It is good to observe and talk about it, but sometimes we are enlisted unawares by despair itself (this is no criticism of your post, just a sharing in love and Spirit). Thank you for the sharing. Thank you Miguel for sharing here. Have you ever read “The Wasteland” by T.S. Eliot? I’m interested in it. One of these days, time permitting, I just may do a study on it. I like that T.S. Eliot grappled with his discontent of Western culture and creatively expressed it. He did become a Christian later. I am a big fan of Francis Schaeffer and was like a kid in a candy store when I found his 10 part/5 hour long documentary on Youtube, “How Should We Then Live” (https://en.wikipedia.org/wiki/How_Should_We_Then_Live%3F). My husband teaches on worldview, and I absolutely love it. 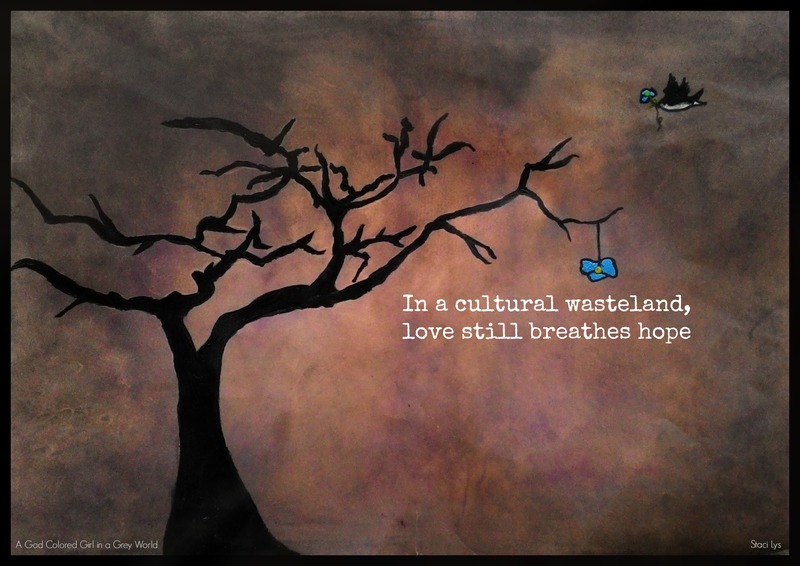 The idea of this art piece and post was to say that, even in a place that seems to be somewhat of a wasteland, there is still hope. I have but read some of his quotations alone. But I will now attempt to dig up more. Perhaps even order a book. I order lots of books. And you’ve made me curious about that documentary. I love documentaries. I def will look it up. And, must apologize about not saying anything about the painting. I too am a artist, but however overlooked that you had made that painting, till I’d read some of the comments. I do like that picture, great message of hope. Thanks again. Ohhhh, haha. Thank you. I actually made the painting for a Brazilian arts project. There are a number of poets supposedly interpreting it now and writing a poem. There will then be a virtual exhibition of some sorts. I don’t know if you know this or not, but I live in Brazil, and that’s the link to the Brazilian poets. So you’re an artist? Cool. What kind of art do you do? Plus there’s the book. It truly opens up ones eyes to understanding how the west became as it is today. It goes throughout all the different eras throughout history since the early church during the Roman era. Then towards the end it gets into the affects of post-modernism, modernism, humanism, and so on. It’s heavy stuff, but soooooo good. I really enjoyed it. I just have to warn you though, it was done in the 70s and is a bit cheesy. Especially Francis’ clothes. He lived in Switzerland and had a thing for knickers. Hahah. Yea, I love that series with Francis Schaeffer. He goes right through the eras throughout history and the impact it had on western culture and Christendom. I’m just new to art. I love mixed media. Started studying drawing just recently as well. My blog I consider my creativity cupboard. I love the whole creative process and sharing it. Thanks Miguel. I’m just a newbie to art, but absolutely love it. And so I’m going for it. Hahaha. Love your artwork–especially with the bird flying toward the dead tree with a bright blue flower–definitely illustrates the hope that still exists in a dark world. As far as the west becoming a wasteland–I feel the world is becoming like that, at least through the lens of the media. So many negative messages of how to be and what to value–without God one can easily become lost in it. But there is still good out there–still hope and in one way or the other, it will survive and outlast in this darkness known as the wasteland. Thank you so much Crystal. That was exactly what I wanted to betray – that hope still exists, despite the darkness we see happening all over the world. Oh yes, the media. Never have we had so much access to information all over the world. It’s tough to stay positive with all the negative we see, isn’t it. I know people that are addicted to the news, and they live in fear. I don’t want to lose sight that we know there is one more powerful than anything material. Just as you said in your comment, there is still hope. Have a wonderful rest of the week Crystal. Make sure you let me know once you get your book done up on Kindle ok.
Have a great weekend as well Staci 🙂 I will work on getting my book on Kindle over the Thanksgiving holiday. I hope by the first week of December I can announce that the book is on Kindle. I love this comment. What a great quote too. I love that quote, and agree with it. And love what you said about TV being junk food for the mind. Hahahaha. Great analogy. Thanks so much for sharing this here. Ohhhh, I’m so pleased Advaita. It’s a great quote, isn’t it? Oh yes, tv. Hahaha. There’s not much that I watch on TV. Not much there that’s worth it, is there? Have a wonderful day Advaita, and thanks again.